Stop by the plumbing section of the hardware store next time you are looking for new jewelry. These brass things apparently are made to connect two tubes with eachother but they look more like rings to me. They make the most delicious clicking sound when wearing them. Such a great idea! That's what makes you so unique and inspiring. They're obviously selling them in the wrong department. How could anyone not notice they are actually rings? You are always so innovative, and make something ordinary into something super chic. Love this idea.. I will definitely try it out for sure! They look more like rings to me too! And they look fantastic. probably the easiest diy ever! They look gorgeous on you, especially with those white nails! I love it. But I have to ask... how can you function without being able to fully articulate your fingers? Looks like the rings are going over the top knuckle, so I'm assuming you can't bend it, right? I think that would drive me insane if I tried to survive a day like that. Look amazing though! haha no, I care about a little practicallity! And these are actually not that bad..you should try it! The rings end right on the joint so you can still bend it a bit. And if you think about it, the joint that you bend the most is the first and not the second, and the fact that my index finger can move freely compensates a lot too. I have a habit of finding nuts and bolts around on the street and turning them into rings/necklace pendants. There's something so lovely about them. wow, i never knew that plumbing could look so chic! Those look so elegant and lovely on you! And I can just hear that "delicious clicking sound"! Adore the Gold Minimalism here! Wow! that's a great idea! most of all i like the monograms on them! Ivania, you have a new follower in me :o) Your blog is so beautiful, crisp, clean and just right. Loving this idea about the rings, will definitely have to try it out. just yesterday I went to the hardware store to look for rings! But search wasnt successful. I found nothing really :( And I'm looking for exxactly these rings but in short. You're genius. Really you are. I love how I can come to your blog and see the most amazing, creative fashion from things deemed so "ordinary," and "unrelated." You're constantly inspiring me! SOOO COOOOOOL! :) Craving so badly now!!! the rings are pretty cool... but the bracelet is absolutely georgeous. where can I get it? thanks; really like your blog! An idea so original & simple just MUST come from you. God I'm so jealous of your creativity! I saw another blogger post them 2 months ago! I love yours they are super shinier! you just have the most creative mind! they look so great. 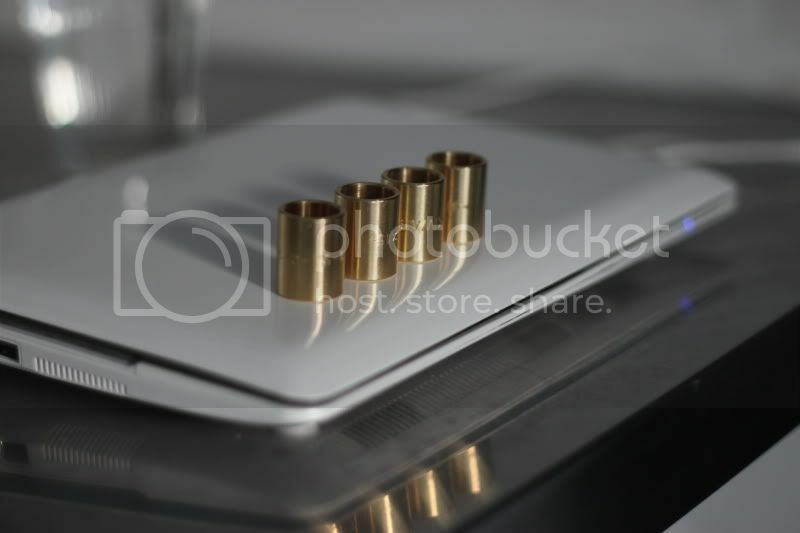 these golden rings are beautiful, you wouldn't expect to find them in a hardware store. I found some crazy chains in that kind of store that would make great headbands ! you are the only girl i know who can make random bits and bobs into lust-worthy accessories. touche. Very creative...and sometimes the sound a piece of jewelry makes is better than the item itself. Your blog is my new favorite :D. Absolutely love it, and I love all your DIY-projects <3. Absolutely amazing! You have such a great eye for things others might miss! 5inch and up already did this a while ago with almost identical text passage. Seems like you just copied her ideas and presented them as your's.....lame. 1st of all:I do not copy any ideas. never. That's something that goes against my deepest values. 3. I've been using plumbing tubes as jewelry for YEARS. It's a pretty obvious thing to do,(it's round, it's brass, it fits around your finger, anyone can come up with that) As you can read in the comments a lot of people from all around the world do! Did they all get it from me or from 5inch &up? No, they came up with it themselves, and so did I.
where do you get a bracelet like you'r please contact me. Not saying you plagiarized- at all. I did a post and showed a pic of a hardware store ring- its very different looking than yours- brushed and hex. ik heb ze ook gekocht! in mijn outfit van vandaag draag ik ze. HAUT! I love this idea! this is amazing. you have the most wonderfull ideas. obsessed. Those rings are really cool! Maybe you should try a pipes or tubes and make an accessory out of it. Amazing! Cover Letter Examples Squidoo : Welcome to Squidoo. it's best to learn how to write one by looking at some cover letter examples. Free resume Cover Letter Examples Free resume Cover Letter Examples ; Write Cover. How to Prepare a Fax Cover Sheet eHow.co.uk. all of the documents to be sent via fax. The cover sheet notifies the recipient. How Can I Get to the Blank Fax Coversheet. the pre-printed instructions on the fax cover form. Free Fax Cover Sheets Templates by MyFax. MyFax offers 100 free printable fax cover sheets. The fax cover sheets are provided in Microsoft Word format and can be edited and. �2010 Protus IP Solutions. All rights. I've never thought of using those rings as actual rings for your hands! My husband has a few in the garage. I wonder if he'll let me wear them! I don't think they are as shiny as the ones in your pictures, though. You say that you can get them at basically any hardware store? I like this post. It talks about many issues in our daily life. I'll keep this page for next time using. Thank you for sharing, it's very useful indeed. Thank you so much for this wonderful article! Here we all can learn a lot of useful things and this is not only my opinion! Even BLNCK corp. and http://www.wilcoplumbers.com.au/ confirmed it!